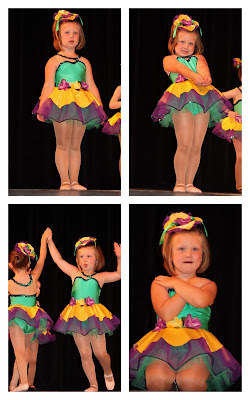 Saturday Night was Brylee's Dance recital! She did great; we were so proud of her! Her first number was her tap routine to "Little Eskimos". This was her favorite of the two. She looked so cute in her little costume and did a great job! Her second number was her ballet routine and she was a Dancing Tulip. She did a great job! 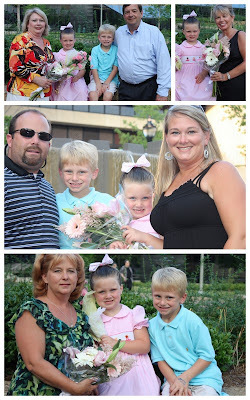 She was so EXCITED about getting her flowers after her recital!!!! She was also so excited about all the sweet family and friends that came to watch her dance. Thank you so much GoGo and Grandaddy, KK, Granny, and Mrs. Cathy (who some how we missed a picture with her) for coming to see our baby girl dance. We are so proud of her and we thank you again for coming to see her dance! We love you! After we ate we also went to SoHo Sweets and got ice cream! Congratulations Baby Girl and your 3rd year of Dance!